Foreign labor standards allow unsafe working conditions in many countries. When you buy made in the USA products, you support not only American manufacturers but also American workers, safe working conditions, and child labor laws. Jobs shipped abroad almost never return. When you buy made in the USA products, you help keep the American economy growing. US manufacturing processes are much cleaner for the environment than many other countries; many brands sold here are produced in countries using dangerous, heavily polluting processes. When you purchase made in USA products, you know that you’re helping to keep the world a little cleaner for your children. Many countries have no minimum wage restrictions, or the minimum wage is outrageously low. When you choose made in the USA products, you contribute to the payment of an honest day’s wages for an honest day’s work. The growing lack of USA ability to manufacture many products is strategically unsound. When you seek out American made products, you foster American independence. The huge US trade deficit leads to massive, unsustainable borrowing from other countries. Debt isn’t good for you and it isn’t good for America. Foreign product safety standards are low. For example, poisonous levels of lead are in tens of millions of toys shipped to the USA. When you buy toys and other made in the USA products, you can be confident that American consumer protection laws and safety standards are in place to protect your family. Lack of minimum wage, worker safety, or environmental pollution controls in many countries undermines the concept of “fair and free trade”. No Western nation can ultimately compete on price with a country willing to massively exploit and pollute its own people. When you buy only American-made products, you insist on a higher standard. Factories and money are shifting to countries not friendly to the USA or democracy. When you avoid imported goods in favor of American made items, you help ensure that the United States doesn’t find its access to vital goods impacted by political conflict. As the US manufacturing ability fades, future generations of US citizens will be unable to find relevant jobs. Buy American and help keep your friends and neighbors – and even yourself – earning a living wage. Do you look for the Made in USA label? 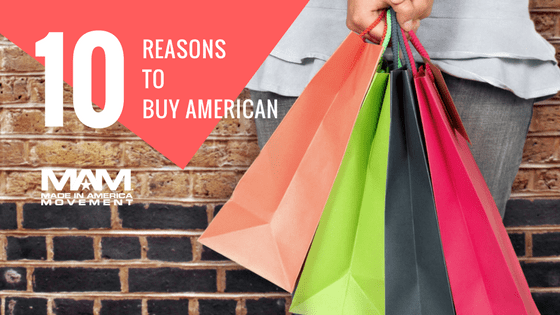 What are your reasons for buying American made? Let us know in the comments below! I’m all for it. Stop buying from China who is stealing from America and hates us. China is NOT our friend. I have always felt we should always support your local businesses and companies! If we could have a economy in this country the way it was back after WWII and up until the late 70’s, that would be wonderful! The cost of living & the wage scales were more balanced and our citizens were living a better quality of life!! We need to bring that Balance back!! Some top reasons why I prefer to buy American made products: first and foremost, to help save or create jobs in the United States, second, Products made overseas have a higher carbon footprint than U.S.-made goods, third, Goods made in China or India have to be shipped all the way across the ocean to reach American stores, burning fossil fuel and spewing out greenhouse gases with every mile they travel, fourth, the lack of environmental and safety regulations overseas doesn’t just put foreign workers at risk – it can also threaten our health, and fifth, its benefits ripple throughout our entire economy, when American factories prosper, they hire American construction firms to expand their buildings, American accounting firms to handle their money, and American energy suppliers to provide them with power.